But when the PC was rebooted, the setting went right back to the “let me choose” option! Thinking his client might have a malware infection, Barker ran some expert diagnostic tools to see what was going on. He found the culprit in plain sight: an executable file actually named Disable_WindowsUpdate.exe forced Windows Update to the dangerously user-dependent setting every time the machine was rebooted. But it wasn’t malware stealthily injected by an anonymous hacker. Barker discovered that Disable_WindowsUpdate.exe was digitally signed by Samsung, and was part of the Samsung’s SW Update Tool. Every computer hardware vendor bundles its own system maintenance software with its machines. These proprietary programs duplicate many functions built into Windows, and many people consider them to be bloatware that can be removed without repercussions. But there’s one important difference between Windows Update and proprietary maintenance toolkits. I know some people advise turning off Windows Update, or picking and choosing which updates to install. I feel this is dangerous, and ill-advised. The chances of being negatively affected by a Windows Update patch are vanishingly small, while the chances of missing something important by not using it are high. Most recent comments on "Who Got Caught Disabling Windows Update?" So far, I have had no problems with windows updates on my Windows 7 computer. I use the automatic updates, but I still have to tell Windows to install the updates. Bob, what about the optional updates? Do they always need to be installed? I have four of them waiting for me to make a decision about them. I admit that i usually don't install the optional updates. HP delivers employee PCs with Windows Update turned off. They push out updates automatically. Of course, not realizing this (because they also didn't tell us), I ran it manually. It applied 113 updates, including (IIRC) 26 critical updates. Yep, that automatic push is really keeping HP's machines current! Never will I do this again. potential problem in the last several years. As I travel with an ASUS laptop running on XP (and often in outback Australia with limited time and download speed. Although I work with the 'ask me' option on there about 10 MS downloads that are want to be downloaded but are irrelevant to my XP. If I used the 'automatic' option I would never be able to be sure that the programs were relevant and also defaulting to 'install and close' every time I log on. Like the others here, I have had negative experiences with Windows Update that have inspired me to go the "Ask me" route. I have not regretted this ever and have never encountered anyone whose experience differs. Microsoft does too many things too awkwardly too often to let them loose in my machine without my close supervision. I always choose. Windows update frequently wants to install updates for apps or hardware I don't have or use such as Skype or Samsung phones. I had the opposite problem in losing many hours of work due to an unexpected MS auto-download/re-boot. Seems a previous one had switched my system back to Auto without telling me...grrr! Hello Bob! About 4 years ago I bought new desktop Dell machine and forgot to turn off automatic updates. After about half year without a problem, one of the automatic updates gave me a black screen with choices how do I want to start up. None of choices was working except DIAGNOSTIK! But diagnostic was running all day long without stop. After 2-3 days without luck I decided to reinstall windows! It was horrible experience. I did not backup every day only once in 2-3 weeks, so I lost a lot of data! Never will do this again! Only “let me choose”! I have update turned off because left on it loads updates to Office Live which have repeatedly messed up my machine big time. Only solution to do a System Restore. So I do the "leave me to download and update" an deselect Office Live. When Microsoft fix it (though I don't know how I will know), I will revert to "Update Automatically"
Although I have a legit copy of Windows, ever since MS sneaked in the patch that checks for pirated copies of Windows I have lost complete faith in MS. I have my machine set to check for updates but let me choose which ones to install. I will not allow MS to turn my machine into a useless boat anchor again. I also do not install any of MS's drivers for any of my hardware as I know that they are typically not as good as the ones provided by the manufacturer. I diligently keep my drivers up to date on my rig as well as updates therefore I know that it is always patched properly and with all of the latest driver updates. I got reminders to upgrade to 8.1 from 8.0. I had ignored these, because I did not want 8.1. One day I got a message that my computer was going to shut down for updates. It was down for about an hour. (Very annoying) When I was able to get on again I had 8.1. A lot of things had changed on my computer. If I had been aware that these changes would be made I could and would have done something to save what I wanted. Boy, I am with the group, that wants to install, at their own risk. I have done both ways, automatic and do not install, without my approval. I can't tell you, how many times, that I have had to re-install games, because, of the automatic updates!!! Right now, I have about 6 games, where I need to insert the CD, to activate them, again!!! I have it set, for automatic, to see if, I can get the Windows 10 icon, in the taskbar and it hasn't worked. Oh, it worked on my Hubby's computer, but, not mine. I DO have a Genuine Windows 7 Professional 64-Bit OS, yet, the Windows Update does not seem to recognize it. I am going back to ... Update, when I give approval. I felt I had to chime in *on behalf* of customers who don't read geek newsletters or understand the first thing about their computers. Think guys, how those customers outnumber you, by the thousands. Most don't understand anything, they just want their computer to work so they can play on Facebook and watch funny cat videos. Meanwhile their updates have been turned off and all kinds of nasties are helping themselves to these vulnerable people and their computers. Now, YOU GUYS know what you're doing and that's why there's the option "let me choose". But for the vast majority of computer users, they are better served by the auto Updates. Then, if their kids or tech says 'hey, pops, there's a better driver I can download for you", then THEY "can choose" (like you get to choose) for themselves. But do you guys really think that it was perfectly OK for Samsung to do what they did? It was egregious. No, I'm not a computer geek, and neither am I a MS groupie. But I'm not a novice either. I read HowToGeek.com and BobRankin, but most, if not all of my friends and colleages have no idea any of this is even going on. @Nightwish_Fan --- You are correct, Newbies or Non-Savvy Computer users must have the automatic updates, from Microsoft, for their protection. I fully agree, with you. Sometimes, I forget, that not everyone knows much about computers or even, knows how to fix anything, on a computer. When I did a fair amount of repairing PCs for family or friends, I always made sure, that Window Updates were always set to automatic, for their own protection. Most of them, would never remember, to check for MS Updates and to download them or install them. It is/was just as hard to get them to remember to update their A/V programs, if, they were using a FREE version of an A/V program, that didn't have automatic updates. I started using Avast! 's FREE version, for that very reason ... It has had automatic updates, since, the beginning or for a lot of years. Thanks for the reminder, about what Samsung has been doing, that is totally wrong, for their consumers. It looks like HP does this, to business PCs ... NOT good, either. I do realize, that BIG business has an IT Department, but, what about the Home Office business or just a Small Business??? They need protection, too, don't they? I'm on Windows 7 (for now, while I learn Linux) and like others, go with the "ask me" option after each time it auto updated, PUPS rode in with them. It took too many times of cleaning out garbage that I decided to learn Linux. You are naively stuoid and blind about windows updates. Read your reader's comments and WAKE UP. 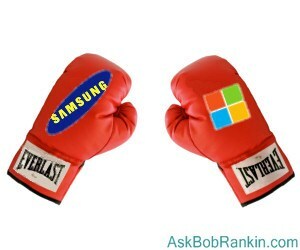 To blindly install every update that the criminals at Redmond send out is an act of sheer stupidity. Relinquishing control of your own PC to a gang that has issue patches for their patches ad infinitum, is purely asinine, especially when you coax your reader to do it. EDITOR'S NOTE: You are welcome to your opinion, but I won't be changing mine. Without automatic software updates, we'd have tens of millions of impossibly corrupted computers spewing spam, spreading viruses, and attacking others via sprawling botnets. Sure, there will be some glitches caused by updates, but these are quite rare in the big picture. How many users are savvy (or interested) enough to examine each software update that's offered, and do the research required to determine if it might cause an issue with their computer? Unless you are an expert in computer security, networking, mass storage devices, font management, print spooling, device drivers, and a dozen other specialties, you're just going to be guessing most of the time. Automatic updates have a huge upside, and a small downside for a tiny percentage of users. Auto update - no way. I had it set that way, but every time it updated I had MAJOR problems and would need to restore. I prefer to have it alert me and I choose what I want to download. I turn auto updates off because it never fails... any time it's enabled, my computer has nothing but problems to the point of having to re-install Windows. This past month I neglected to turn it off on a new computer before I went online to download my firewall and anti-virus and before I could stop it, it started downloading several hundred updates, security patches, drivers, etc. I stupidly decided to give MS another chance (my bad!!) and left it on. My new computer slowed to a crawl and BSD, freezing and random reboots began to occur. It was also downloading updates several times a day. I ended up wiping the HHD of a one week old computer, reinstalled the OS and once again set updates to "never". With a good firewall and anti-virus, my computer runs fast and clean and I've never had any problems with updates turned off; only when it's turned on.